Are you looking for a delicious and easy meal for your next family dinner?… Look no further because this recipe will have everyone smiling ear to ear. It was so good and best of all, EASY! Aren’t those the best kind?! I got this recipe from my local grocery store and it is now a regular in my home. Try it out! You will be so happy you did! Place 6 boneless skinless chicken breasts in crock pot.Mix 12 oz sour cream, 1 can cream of mushroom soup and 1 package of dry onion soup mix.Pour mixture over chicken. Cook on LOW for 4-6 hours or until chicken is tender. Serve over cooked noodles. This sounds delicious! Slow Cooker meals are the key to dinner on one of those busy nights when the boys have games on the opposite end of town from each other. Thanks for sharing. Looks delish and simple -- going to try it this weekend! Thanks! Hi Nikki, this looks amazing! I'm excited to see you're attending SNAP next month! Should be so much fun! Hope to meet you there! Happy and safe travels! Oh this looks so yummy!! I'm loving all your crockpot meals!! A friend sent me over her to check this out and it sounds so EASY and FABULOUS!!! Thanks so much for sharing with us! Is the mixture supposed to be pretty thick when you pour it on the chicken? Hope I did it right! Hi, try adding dash of cardimon, corriender, and, a splash of red wine. It adds alot of life to this dish. Love your website! Thanks for the recipe! This was a huge hit at my house....especially with my husband who gets really tired of my old "stand-bys!" I live down the street from your Aunt Dawn and saw the recipe sitting on her counter and she told me about your blog. Everything looks so yummy. Thanks for putting in all the time to post your recipes and pictures. This sounds delicious! Will definitely try this today! However can I recommend that the sour cream be stirred in just before you're ready to eat? As the food network says "Dairy products, like sour cream, milk or yogurt, tend to break down in the slow cooker. To prevent this, add them during the last 15 minutes of cooking." Other than that, this sounds great!! Thanks!! Great tip Amanda! Trying this tonight! Trying to think why it would be so watery. Did you cook the noodles separate or add them in with the water? If so, that may be why. That is very puzzling otherwise. Made this today to take to a function at our church for elementary aged kids. It was well liked by all. Even my son, who is a very picky eater, asked for seconds. It was a little more watery than I expected, but no one complained. I doubled the recipe and cut the chicken into bite sized pieces. I used low sodium cream of mushroom soup. This recipe is a HIT!!! Does the chicken need to be thawed before put in the crock pot or can I put it right in frozen from the package ? Does the chicken need to be defrosted? 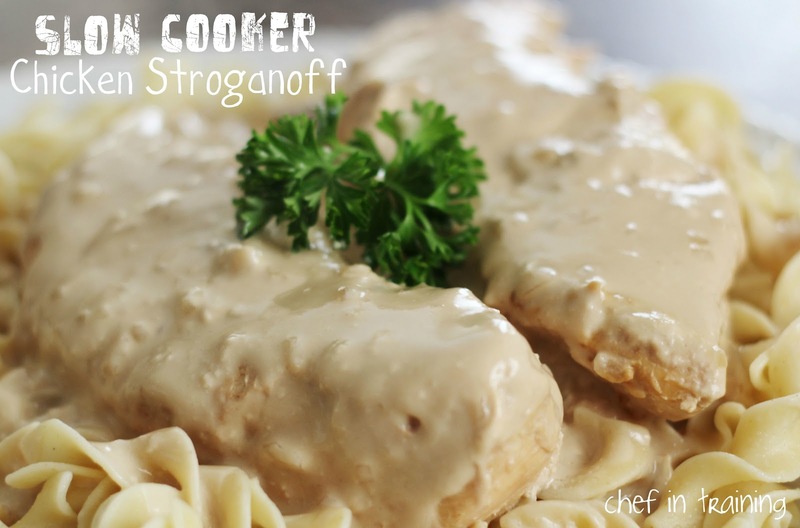 Hello, I love this chicken stroganoff recipe so I bookmarked it to make again, but the page is not displaying this particular recipe for some reason. Help?! so sorry about that! It should be displaying now :) Thanks for bringing it to my attention. This looks real good. I've been looking for something easy my family loves a good stroganoff. i'm going to add 2- 4oz cans off mushrooms they also love them in any stroganoff.